When an agent discovers the land of Toonopolis, he and the Agency believe they can use the cartoon world to stage covert operations. The teenage son of the lead scientist becomes the first operative in Toonopolis. Toonopolis: Gemini is an off-the-wall comedy adventure set in the cartoon world of Toonopolis where an incomplete ‘Outsider’ named Gemini goes on a quest to complete himself and in doing so pits himself against a shadowy menace consuming toons and wreaking havoc. Although this is firmly in the young adult category, there are all sorts of references I could appreciate from cartoons, comics and even games. For me, there were aspects of this book that I really enjoyed and there were some that left me scratching my head a bit. I liked the purple eggplant guide named Jimbob. If you think of this character as your typical Robin Williams style one-liner comic relief you’d be pretty close. 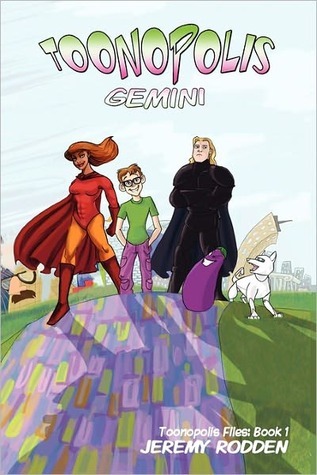 Gemini was a little one-dimensional (for a reason), so it was a bit of fun to have a talking eggplant offer up a myriad of puns and sarcastic put downs. I also liked some of the zany cartoon rules that came into play. The very clever way of avoiding copyright infringement in the story was to TM (terminally move) all cartoons that go public to another place. The Gravity Effectiveness Displacement theory also got a smile out of me. But I think it was the references to popular cartoon forms and genres which actually brought out the laughs. Through the story we get a sampling of many favourites: all quests beginning with killing 5 rats in the cellar, turn-based fighting, anime expressions and action scenes, role-playing games alignments, the plight of the superhero sidekick and the result of our obsession with vampires. All of these and a few more gave me giggles even though some were heavy-handed. The author had a story in mind for Toonopolis: Gemini on top of the comedy and popular cartoon references. However, this is the area that I don’t think worked as well for me. The basis of Toonopolis was that there was a connection between a creator in the human world and that of the creation itself. This became a bit messy for me. A sidekick will be created in tandem with a superhero, so why would they have different creators? Do people create superhero sidekicks without the superhero? If the life of a toon creation is tied to the life of its creator how are ‘Originals’ still existing – cartoons there at the start of Toonopolis? These things wouldn’t have bothered me if there wasn’t so much emphasis placed on the connection to form the basis of the story. Additionally, the idea of TM in the story was a good one, but should have been applied a bit more consistently. We should not have been reading about the butcher, the baker and the candlestick maker, nor should we have the farm of Old McDonald as a location in the story. There was also a small background father/son plot from the real world that trickled into the toon world. Unfortunately, I found this a bit unsatisfying. If you have a YA target audience, a teenager’s feeling of alienation and abandonment is an excellent opportunity to create a connection with your readers as there is a good chance that they will relate and bond with the character. However, the exploration of this side was quite shallow. There seemed to be hints that the main character may not have all the information, but at any point where there were revelations or reversals, I just never seemed to get the full picture behind what happened and why other than the obvious circumstances of the experiment. It was an opportunity lost in my opinion. Admittedly, this story focused more on the fun and absurdity of a toon adventure, but I think if you’re going to go there, go there. It was inevitable that there were going to be some big revelations towards the end of the story and they were there. However, the biggest (and for me, most obvious) revelation was decidedly deus ex machina. I was a bit disappointed that there was no way the author could find to eventually progress the main character’s understanding of himself other than a sudden and jarring aside that came out of nowhere just in time for the final confrontation. That said, for all my complaints about plot cohesion, I thought the book was worthwhile, if just for the fact that it gave me several laughs and smirks. It was an easy and fun read. That I could “get” nearly every reference means that this could be a book that adults enjoy as much as the YA target audience. Of course, it could also mean that I’m just a big kid – which isn’t such a bad thing either. This entry was posted in 3, Novel, Reviews, Young Adult and tagged Comedy, Fantasy, Series, Young Adult. Bookmark the permalink. I really like your wordpress theme, where would you get a hold of it from? Thanks – but this is almost nothing like the theme I downloaded. Completely customised.